Yes, the costumes superheroes use to hide their alter egos are sometimes so transparent as to border on the absurd. But would it really so easy to connect the masked vigilante swinging through the streets with billionaire Bruce Wayne? This real life story has us convinced it may be a bit trickier than we think. It bears mentioning as to the long-standing question of whether or not Bruce Wayne's close friends (those he has) would recognize him as Batman based on his voice, the lower half of his face, and general body language. I recently attended a local anime convention where I live, and spent the day enjoying the exciting array of cosplayers who were there. One of the more impressive costumes I saw there was a really well-made Batman costume which I noticed once across a crowd, and later from a little closer up (though not face-to-face). This was the only person I saw in a Batman costume. A few days later, I was meeting with a friend, and told him I had gone to the convention. "Did you see [a close mutual friend, whom I've known for close to two decades]?" he asked me. "He was dressed as Batman." He then directed me to our friend's facebook page, where he had posted pics of himself in a well-made Batsuit costume. The very same Batsuit costume. 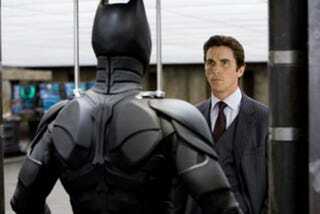 So, would Bruce Wayne's close friends recognize him as Batman? Of course, certainly more than a few agencies would be able to easily pull off an unmasking. And Batman himself certainly hasn't shown much reluctance to let people in on his secret either. But for the ordinary Gothamite going about their day, and even for Bruce Wayne's few confidantes, picking up on just who Batman is during the day from a few, fleeting encounters may be a harder problem to crack than we think.